Dawgdad, you pose an interesting question - how much higher up the graph is the 6.8mm SPC. I also included the 6.5 Grendel. I expected to see better performance. They both had more energy but not much more. Velocity is a significant consideration. The monolithic bullets like a minimum of 2000fps to open up so velocity is critical. I would only use the 85gr TSX and 95gr TTSX in the 6.8 (purple dashed line). The 110 TSX has been reported to over-penetrate in the 6.8 and I think that is because its velocity is too low so there isn't much bullet expansion on impact. The 6.5 Grendel (light-blue dashed line) is enemic to me. It can't even get light-for-caliber bullets above 3000 fps with a 24" barrel. Because both these calibers have limited powder capacity, they will do better with lead-core bullets unless you use the light monolithic bullets which don't exist in the 6.5mm category. I think I'll start looking at the WSSM for my next AR upper. I hunted with a guy that uses a 25 WSSM D-tech upper and it was a thumper on coyotes. I have considered a 243 WSSM for a bit extra point blank range. The .223 WSSM pumps the 40gr pills out at over 4500 fps and is a barrel burner. I'm studying the 7mm or .308 wildcats. They are supposed to be the equivalent of .284 and .30-06 with lighter bullets. 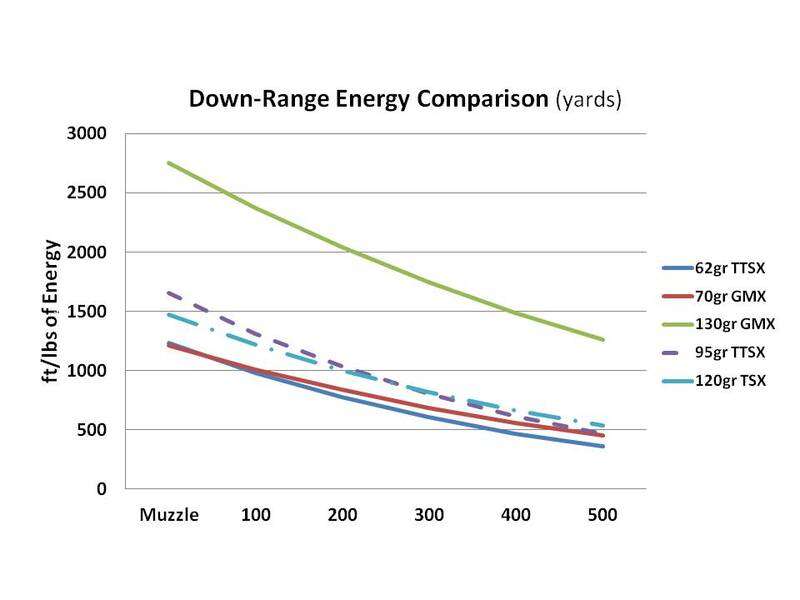 The .358 WSSM has a lot of close range power (beats the .450 Bushmaster) but its bullets are in the lower range for BC values so it looses too much energy at range for my liking. The .338 caliber bullets have noses that are too long and won't fit even in the modified extended mags that lets the bullet tip extend out the front of the mags. Welcome to the world of expansion v penetration !!! Are you saying that you are more in favor of beating the hell outa the sides than in hitting bottom? Just asking. If you are I agree with you 100%. I will have an update tomorrow night on how well they work. we stalked in closer through some real thick crap!!! turpentine scrub ,heather, flax etc all on a steep hillside. we got to a wee clear spot at about 250 but couldnt see animal so we moused in another spur closer... man it was crappy thick stuff and real hard going. 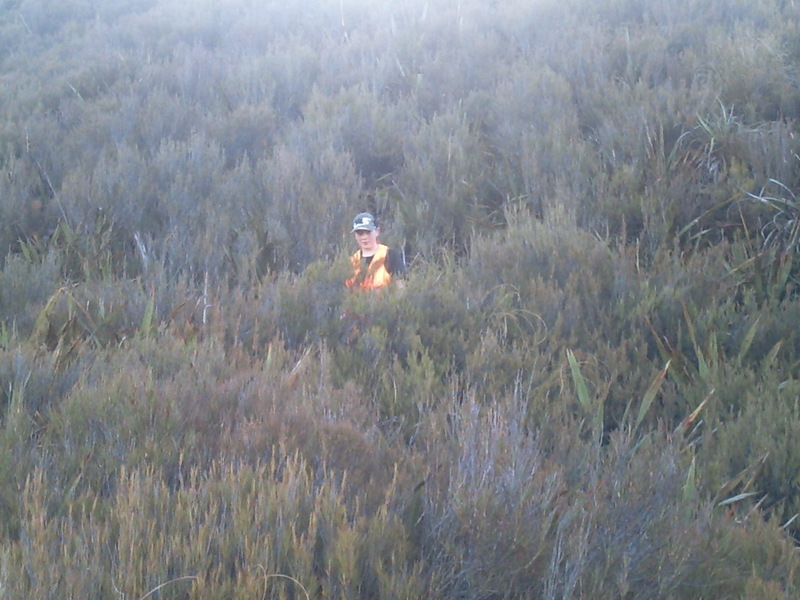 we found another wee clearish spot at 175yrds and I got comfortableish standing leaning on a tree, the young fella spotted a big creamy bum in the scrub so I lined it up.... na not right yet, moved over a tad and leaned on a different branch.. waited till I was rock solid and breathing real easy and poked a round between the shoulder blades from above and behind, it moved off!!! 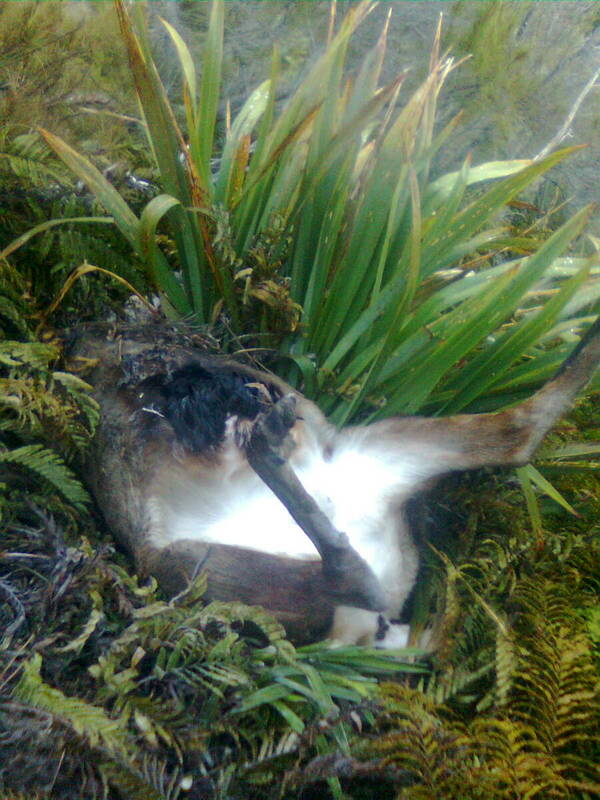 then a stag was spotted so I poked 2 in his shoulder and gave him a 3rd as he layed down!!! not sure if it was the first deer or not will know when I find it tomorrow and look for hole in back. why tomorrow you ask? well plan A straight down and across was beaten by a 75mtr bluff back up to shooting spot and up up up but now getting around the bluffs to get across so plan B was a no go either. we were at730mtrs altitude and climbed up up up through more heater and crap till we hit loopy track at 1100mtrs then waltzed down to car park at 350mtrs. we have plan C go back tomorrow and drop on to it from the other side 450mtrs down off the ridge(gee I love having satelite broadband I can use google earth again) will give update tomorrow. Wow, Elvis, that is some rough terrain! Take your camera with you this time and snap some picks for us. well guys we found the stag. shoulder broken in 2 places and a rib broken with a shot going in lengthways of the body that shot had me puzzled for a while it had gone through the lungs like a hot poker, made a hole but no blood, it wasnt till I was slicing the heart up at home that I found a federal 64 grn projectile!!!! found parts of my 52grn hp speer in the shoulder and one heck of alot of bruising. my lad carried out the scrubby 9 point head and the brother in law gave me a hand to bone meat out and carried some out most of the way before his legs said enough, I put the 4th quarter in my pack and carried on. my pack weighed 35kgs!!! (times that by 2.2 to get pounds). my legs are very tired tonight but Im rapped we went back and got to retrieve the animal. 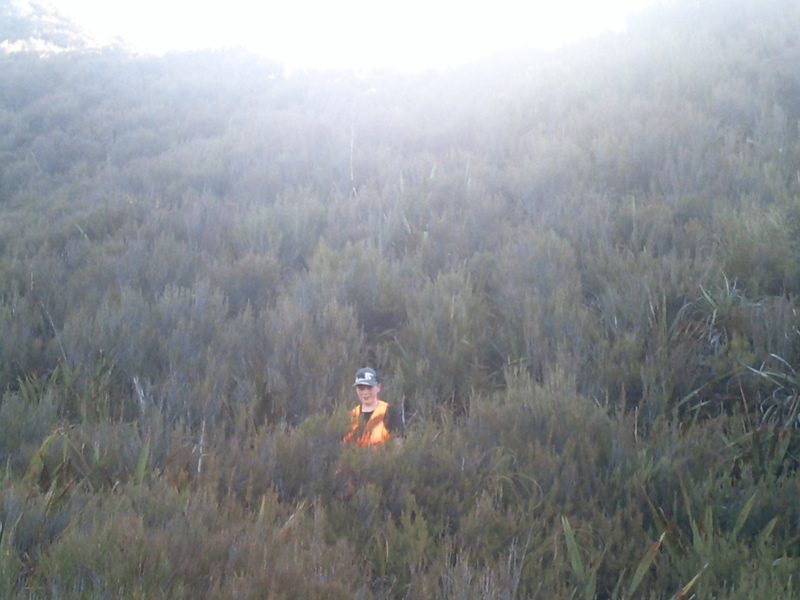 it was plurry hard to find as the scrub was chest high but we kept looking till I smelt him out. will I be using the wee .223 on deer again?? maybe if thats what Im carrying and one pops up, but the .270 is still my deer rifle, if Im poking around on the tops and a chamious is a probability the wee gun may come for a walk. I intend to shorten my .270 just a bit till they are the same length. Very lucky to have found the critter Elvis. I have a mate who uses .223 as a deer rifle, but I've never seen him stop a deer with a single shot...not even on fallow deer. I believe a minimum of ,243 is required to do a humane kill on deer sized game. Having said that I have a mate that uses a .22 Hornet and claims single shot kills every time with a head shot. Stick to your .270 mate...we owe it to our quarry to be humane and not allow them to suffer. Picture of my boy walking in, this scrub one third height of crap from yesterday. I can confirm that thing with the .22 Hornet and fallow deer. But in my opinion a head shot still leaves the possibillity to just knock it KO and it's no fun going to use a knive on an animal that's crawling its feeth... my first choise is the spot where the head meets the neck. It's a very safe way to harvest these animals as most of the time you don't see an exit hole. known as the atlas joint Aloys. now these projectiles have always opened out and expanded well even on thin skined wallabies. Ive shot pigs with them too. yes the .270 is my main rifle and this mystery just adds to the reason to use it. the .223 does kill and that projectile had SMASHED the main leg bone before going into heart so wasnt really a failure. Thanks for the pictures, Elvis. That was some hunt & hike - an adventure for sure. Great pics Elvis, gosh that brings back memories of my boys when they were young and hunting with Dad. Amazing you could shoot, never mind retrieve anything in that scrub. You could hide a whole company in there and unless you stepped on one never know you weren't alone. That slope also looks pretty steep. At least if you tripped up you wouldn't fall very far. Congrats on the successful hunt. Your young mate looks happy enough. Holy crap that some steep thick sht man! Glad ya got the goods though. Good on you and the lad, you are teaching him some serious ethics and tracking skills most of dont! Pretty Impressive stuff man. The boy's gona grow up right.